Missouri Gov. 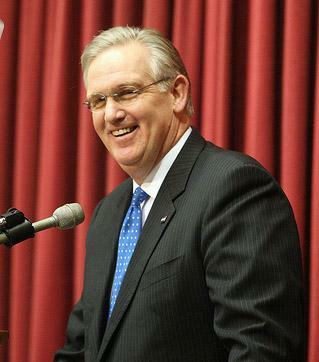 Jay Nixon at 2011 state of the state speech. A discussion on St. Louis on the Air about Missouri Governor Nixon's State of the State address and the Republican Response by Speaker of the House Tim Jones. Guests on the show were political reporter Jo Mannies, statehouse reporter Marshall Griffin and University of Missouri-St. Louis Curators' Teaching Professor of Political Science David Robertson. Nixon’s proposed budget for the 2015 fiscal year, which begins July 1, calls for an overall spending increase of $428 million over the current fiscal year. That means general revenue would increase to $8.739 billion for fiscal year 2015 from $8.311 billion for the current fiscal year. The governor’s proposal also foregoes any tax cuts -- possibly a non-starter among Republican legislative leaders committed to trimming the state's taxes. 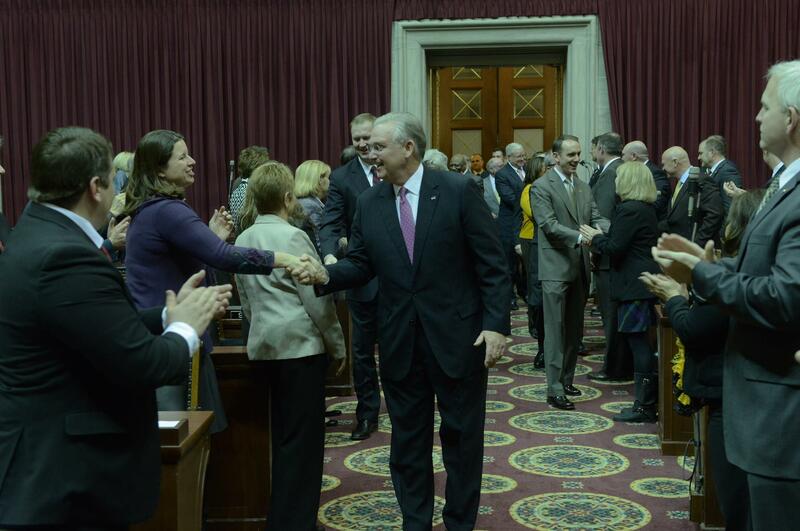 The governor outlined his proposals to legislators packed Tuesday night into the Missouri House for his annual State of the State address. His 56-minute speech was followed by the Republican response delivered by state House Speaker Tim Jones, R-Eureka. Said Nixon: "Tonight, as I have every year, I am proposing a balanced budget that holds the line on taxes – and continues to downsize government, cutting 81 more positions from state payrolls. By the end of this fiscal year, we will have reduced the state workforce by 4,600 full-time employees. "But we didn’t just make government smaller – we made it smarter," Nixon said. "We reduced energy use, sold off surplus property and put more state services online. My budget continues to invest in technology to provide Missourians with the efficient, effective, accountable government they deserve. " Retorted Jones: "Our governor mistakenly believes that more, bigger government is the answer, that his administration can decide how to better use your tax dollars, and that investments should be made in government programs rather than in the industrious people of this state. "What our governor should understand is that we already have too many tax-and-overspend, out-of-touch, career politicians in our nation’s capital. We don’t need one here standing in the way of hard-working Missouri families and businesses who want nothing more than the opportunity to grow and succeed," Jones added. Outside groups also weighed in. Patrick Werner, state director of the conservative Americans for Prosperity, criticized the governor's approach: "Once again, Governor Nixon is asking for taxpayers to cough up even more, while many other states are passing meaningful tax relief and making their states more economically competitive." But Charles E. Smith, president of the Missouri National Education Association, was full of praise, saying Nixon "reaffirmed Missouri's commitment to strong public schools and preparing our students for for the careers of the 21st Century." Nixon’s budget for the 2015 fiscal year, which begins July 1, is predicting that state coffers will be flush enough to increase spending for public education – at all levels – by $490 million. He's proposing some trims in other areas to make it happen. The largest chunk of that added money would go for kindergarten through high school. Among other things, Nixon proposes to increase state spending on the foundation formula – the state’s largest source of aid to local schools – by $278 million. State budget chief Linda Luebbering acknowledged to reporters that the hike is only half of the amount needed to fund the program fully; it has been underfunded for years. If the state’s good economic times continue, the foundation formula should be funded fully by fiscal year 2016, she said. Nixon is proposing roughly an additional $100 million for various higher education programs, but he coupled that with a call for state universities and colleges to keep tuition flat for the coming school year. His additional spending includes $22 million to help students who study science, technology, engineering and medicine -- dubbed the STEM subjects. Nixon framed his focus on education as a choice between helping children or cutting taxes. “I’ve signed four tax cuts as your governor – specific, targeted tax cuts that have helped our businesses expand and grow,” the governor said. 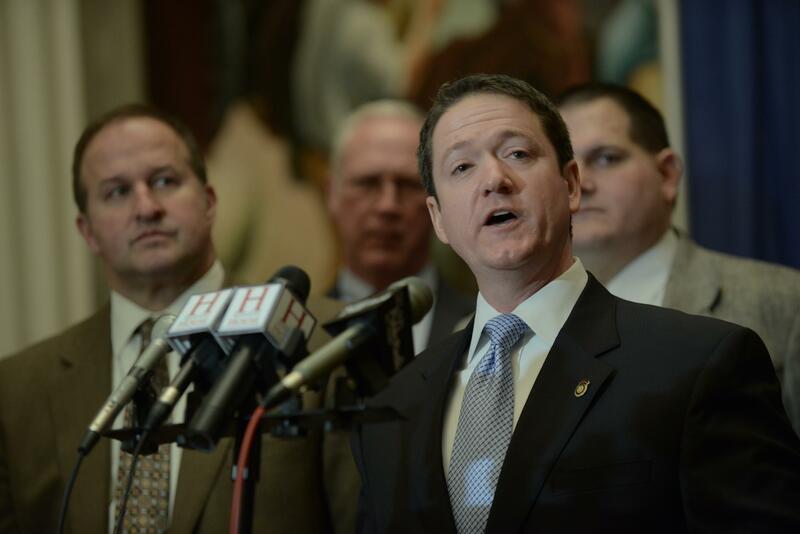 “For example, Missouri employers will save $70 million this year alone because we cut the corporate franchise tax. Jones told reporters afterward that Nixon was misrepresenting the debate and cited the governor’s previous cuts in education funding for transportation. House Speaker Tim Jones and other House leaders address reporters after Nixon's speech. Jones and House Budget chairman Rick Stream, R-Kirkwood (and a former school board member), faulted the governor for failing to address the problems caused by unaccredited school districts, including the expensive transfer programs now underway. Nixon's proposed budget includes $5 million sought by the Normandy school district to pay the costs of students who have opted to transfer to other districts in St. Louis and St. Charles counties. Nixon told Republican legislators that their opposition to expanding Medicaid was simply sending Missourians' federal tax dollars to other states that are expanding, while hurting the state's businesses and low-income residents. In fact, Luebbering said that the state would save $77 million in current health care spending should the General Assembly expand Medicaid to cover roughly 300,000 more Missourians. That’s because some people covered by state spending could be shifted to the federal Medicaid rolls. Said the governor in his address: "Since New Year’s Day, Missouri taxpayers have spent $115 million and counting – $5.47 million a day – to improve and reform health care in other states, like Arkansas and Arizona, New Jersey and Iowa, Michigan and North Dakota. This adds up to $2 billion, or $500 for every Missouri taxpayer, every year. " In a nod to the opposition by Republicans and some Missourians, the governor added, "We all know there are problems with Obamacare, and Washington’s implementation of it has been abysmal. But rejecting Medicaid won’t fix any of those things. It won’t keep Missourians from having to pay federal taxes, or exempt our businesses from new requirements under the law. "Instead, by standing still, we’re making the things we don’t like about Obamacare even worse, forcing Missourians to bear all the costs of this law – and reap none of the benefits. " Stream flatly told reporters afterward that Medicaid expansion wasn't going to happen. Medicaid isn't the only disagreement that Republican legislative leaders have with Nixon. The governor’s budget is premised on stronger general-revenue growth than the GOP-controlled state House and Senate are predicting. As a result, Nixon’s proposal assumes the state would have an additional $140 million in income than what legislative leaders are expecting, Luebbering said. That means that the alternative budget plan assembled by the General Assembly may call for significantly less spending than Nixon. Stream contended that the difference is actually about $300 million, and he warned that House and Senate budget leaders won't budge. "We are not going to spend more than we think is going to come in," Stream said. Nixon's focus on increased education spending could put some Republican legislators in a bind because public education is just as popular in rural and out-state Missouri – which are GOP strongholds – as it is in urban and suburban parts of the state. Nixon and his budget chief tie the state’s improved financial status to the state’s employment growth – with an added 40,000 more jobs just in the past year. Missouri is in the nation’s Top 10 in private-sector job growth, the governor said. Personal income for all Missouri workers also is up by about 4 percent over the past year, his budget chief said. Jones painted a different economic picture, asserting that Missouri is lagging behind many of its neighboring states. "We want to import jobs and opportunity for all into our state while our governor wants to import D.C.-style taxation, D.C-based budgeting, and D.C.-inspired overspending," Jones said. "We will not allow this to happen on our watch." Although the governor's address kept with tradition by focusing primarily on the budget, Nixon also touched on other issues, He renewed his longstanding call for the General Assembly to restore some form of campaign donation limits, along with other ethics reforms. Nixon also beseeched legislators to pass a measure -- which won Senate approval last year -- that would bar businesses from firing employees on the basis of their sexual orientation. "No Missourian should be fired because of who they are or who they love," the governor said. Inform our coverage: Click here to share through our Public Insight Network your reaction to Gov. Nixon's State of the State address. Missouri Gov. Jay Nixon will deliver his annual State of the State address Tuesday night, during which he'll unveil his proposed budget for fiscal year 2015. The governor was expected to announce funding increases for both K-12 schools and higher education, along with a warning to House and Senate GOP leaders not to cut taxes. Nixon vetoed last year's tax cut bill (HB 253) and successfully fought off an attempted veto override last fall. The Democratic governor is also expected to make another pitch for expanding Medicaid. Will the session be about the past – the continued debates over Medicaid expansion and tax cuts? Or will it be controlled by new matters – notably, the unrest over student transfers from failed districts and the looming 2014 elections?